“I have a question,” the young woman said. Oh dear. She was a friend of a friend and she was taking the opportunity to grill a seminary student on the problems of Christianity. She was not religious enough to believe, but she was too religious to just stop worrying about it all. We’ve already covered Virgin Birth, the real presence in Holy Communion, the checkered history of the Church. What next? She was right. Whatever his motives, Judas was asking a serious question. And without a doubt, Jesus gives him a puzzling answer: “Leave her alone. She bought it so that she might keep it for the day of my burial. You always have the poor with you, but you do not always have me.” These words have caused a lot of anguish and misunderstanding over the years. So let’s take a moment to understand what’s going on here. Mary, Martha–who prepared the meal–and Judas are involved in an argument about what we today might call ‘priorities.’ If we think of this dinner as a miniature church, you might say that Mary is trying to make worship a priority. Martha did all the hard work of making and serving the dinner. And Mary decides to hog the spotlight again, just like she did in the famous story of Mary and Martha fighting over the attention of Jesus. Mary pours out a truly extravagant quantity of very expensive oil on Jesus’s feet. The house is filled with a beautiful smell, like the Temple when incense is offered. The oil is being used for an act of reverence to Christ. And she goes further. She undoes her hair to wipe her teacher’s feet. This is pretty scandalous. It would be like singing a solo with the praise band while wearing a designer miniskirt. Is this Mary’s devotion just overflowing? Is she expressing her love for Jesus without fear of what anyone else will think? Or is she flaunting her wealth and taking improper liberties? Judas is arguing for social ministry. Forget for a moment the accusing parenthesis in the story, about Judas stealing the money. The other disciples don’t know this yet anyway. He’s looking out for the finances. He’s trying to keep the group mission-minded. The town where they are eating, Bethany, means “house of the poor,” after all. Mary’s use of precious resources is shocking alongside the deprivation in which most people lived at the time. What would those poor masses whom Jesus fed by the lake be saying now if they saw this scene? What will young pastors say when this story offends someone? Meanwhile Martha is chairing the fellowship and hospitality committee. She’s making the food, taking care that everyone is comfortable and happy. Her priority is making sure that things go smoothly. There’s not much glory in that. No extravagant displays and no sanctimonious charity. No one notices when the fellowship committee is doing its job well, but Martha could claim that it’s the most important job. There is something just not right about pouring out $40,000 worth of oil at one dinner. It’s irrational, wasteful, out of proportion. Surely there should have been some discussion beforehand. A congregational meeting should have been called and a budget should have been drawn up. We set aside 25% of the ointment for Jesus and sell the rest. 25% of ointment revenue goes to social ministry, 25% to reimburse Martha for this big dinner, 15% to replace the fridge that we bought with a trash bag full of nickels in 1955, 10% for cash reserves. “Are you with the shameless Mary, worshipping Jesus with everything she’s got, risking the wrath of her sister who’s doing all the hard work, the anger of the men who perhaps don’t quite trust their own feelings when a woman lets her hair down in public, and the sneer of the person who knows the price of everything and the value of nothing? “Or are you with cautious, prudent, reliable Judas (as he must have seemed to most of them), looking after the meagre resources of a group without steady or settled income, anxious to provide for their needs and still have something left to give to the poor? … Put aside your natural inclination to distance yourself from Judas. After all, even at that last moment none of the other disciples had suspected him of treachery. Can you see just a glimpse of him as you look in the mirror? Arguments over priorities can be some of the ugliest and most painful arguments a church ever experiences. This is partly because there are valid arguments for different priorities. It is partly because our identities are bound up in what we do in church. When the church music budget gets cut, the music director understandably feels that her work is not valued by the church. When social ministries are scaled back, the social ministry director feels that all her hard and selfless work has been neglected. When church councils and pastors try to resolve these conflicting priorities, we find that as often as not, no one ends up very happy. This is where Jesus intervenes. It might seem at first that Jesus is taking Mary’s side against Judas. This is not necessarily so. “She bought it so that she might keep it for the day of my burial,” he says. By saying this he is perhaps signaling to Mary that she should hold off on using the whole pound of ointment until after his death. He is urging some restraint while saving Mary from embarrassment. Then he says “You always have the poor with you, but you do not always have me.” Some people quote this line to argue that we shouldn’t worry too much about poverty because it’s always going to be there. That is hardly what Jesus meant, since he lived his whole life among the poor and promised them the kingdom of God. Jesus is saying, rather, that there will be plenty of time to share our goods. There will be plenty of human need and suffering to reach with our good deeds, and we will somehow always find what we need to do it. Jesus is not demeaning the fellowship committee or the social ministry committee. He is not trying to set worship as the first priority for all times and all places. He’s saying that at this time and this place, his death and burial are most important. So what would I say if I had the chance to talk to my skeptical companion again? What should we say to a world that sees only conflicting priorities and intolerable trade-offs in a scene like this? I would say this: we humans live in a world of limited means and unlimited desires. We want to do everything but we only have so much. So we have to make hard decisions about our priorities. Charity is always good and hospitality is always necessary. But sometimes extravagance flows from the heart, too. And moreover: Jesus was opening the door to the kingdom of God. Here and now we struggle with finding the right use for our limited resources. In God’s kingdom, there is no jostling for priority. Everything is charity and everything is worship and everything is fellowship. A pound of ointment and a scented house are just a glimpse of that feast of abundance that awaits the rich and poor alike. By anointing his feet, Mary is particularly worshipping Jesus in his actions. His are the feet that crossed the length and breadth of Palestine, that brought good news, that went out to feed the poor, that are finally nailed to the cross for the redemption of the world. And she wipes these feet with her hair–at the time, a very sacred and intimate part of one’s own body. Remember that the Old Testament hero Samson’s strength resided in his hair. To wipe Jesus’s feet with your own hair, then, was to embrace all that Jesus did with everything that you are. Extravagant worship flows into extravagant charity. Has God given you a heart for worship? Then worship faithfully, and God will also teach you to serve. Has God given you a heart for social ministry? Serve faithfully, and God will also teach you to praise. Has God set your heart on making the coffee and setting the table and going unnoticed? Welcome the saints and God will put a song on your lips. We must content ourselves with our priorities. But God is greedy for all of it, and God will give us every chance to offer it all. Amen. I’m a Lutheran pastor (ELCA, in case you’re interested) who has written on topics on religion, politics, and culture for Aeon, The Christian Century, Religion Dispatches, Pacific Standard, and other venues. 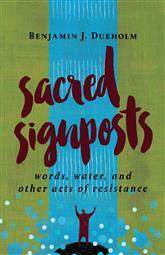 I’m the author of Sacred Signposts: Words, Water, and Other Acts of Resistance, and I help edit Let’s Talk: Living Theology in the Metropolitan Chicago Synod. I serve Messiah Lutheran Church in Wauconda. Opinions expressed in my writing are, regrettably, my own.